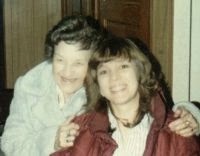 It was 24 years ago today that my grandmother passed away. I don't spend much time thinking about that day anymore, but I love the memories she left with me. She was no ordinary grandma. She traumatized me with Dippity-do, poisoned me with her Green Drops medicine, almost ruined me for wanting children with the Ugly Baby, and totally "bamboozled" us with her tall tales of dying from pimples, getting our eyes pecked out from pet birds, and the terrible, terrible things the doctor would have to do if we got constipated. She taught me Guppy Genetics, how to feed anyone anything using meatloaf, the art of making a sewing pattern out of newspaper, and playing the piano chords of the old 1940s dance music while she played the melodies. She was fun - we had things at her house that we didn't get at home, like treasure boxes, the Family Doghouse, homemade picture books, sea shells, and party hats and noisemakers. And she let us play with glitter. That never, ever happened at home. Ever. She had her idiosyncrasies. She loved her grandchildren, but would lock us outside in a heartbeat when As The World Turns came on. She "flowered-over" ex-spouses and boyfriends, no questions asked. She kept secrets well and bent over backwards to cover peoples' faults. She rarely had an unkind word to say about anyone, but if someone said something bad about one of us, they'd better watch it. If it wasn't true, she'd set them straight in no uncertain terms, and if it was true, she'd tell them to mind their own business, in a very polite way, of course. Even after 24 years, it doesn't feel as though she's gone. I feel her presence every evening when we have dinner at her table, serve something in the pink bowl, when I'm in my sewing room, watching the bird feeder and telling stories about her to my young granddaughters. So this day, it's her living I will remember. beautiful!! You were a lucky young lady! Thanks, Randy. I appreciate the comment. Have a great weekend! What a sweet post for a very sweet grandmother, Karen. Wonderfully remembered.